Betty Beatrice Warren Eagleton, 91, passed away Friday, November 23, 2018. Memorial Service: 2 p.m. Thursday in Biggers Funeral Chapel. Betty Eagleton was born June 17, 1927 near Wichita Falls. She moved to Fort Worth during high school and was a long time resident. Betty worked for Pangburn’s Candy, Leonard Brothers, General Dynamics, and A. Davis Men’s Clothing. She also owned and operated Camera Repair Center in Fort Worth with her husband. 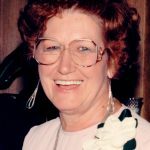 Betty enjoyed raising four sons, cooking homemade meals, hosting family dinners, spending time on the lake, and planting and gardening. She was preceded in death by her husband of 64 years, Phil Eagleton. Survivors: Sons, Randy Eagleton and wife, Lori, Russell Eagleton and wife, Paula, Ed Eagleton, and Kenneth Eagleton and wife, Kathy; nine grandchildren; and 11 great-grandchildren.